The orcas that live off the U.S. Pacific coastline—the Southern Resident Orca—are critically endangered. They organize their society along matrilineal lines in three distinct pods (J, K, and L)- each with their own unique dialect. Throughout most of the year, the three pods roam separately, and they are known to celebrate when they come back together in the Salish Sea. For more than two decades marine parks had taken or killed over 50 individuals from the Southern Resident Orca population- approximately 40% of the population. In 2005, the Southern Resident Orcas were designated as endangered under the federal Endangered Species Act, and they are one of the most critically endangered marine mammals in the United States. After reaching a peak size of 98 individuals in 1995, the population has declined to 76 individuals today. There are now less than 30 effective breeding population members. Of the six babies that were born in the “baby boom years” of December 2014 through 2016, half have died. Not a single baby born in 2017 has survived. 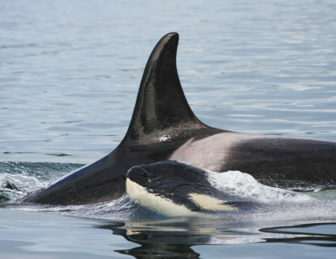 Two mothers (J14, J28) and a great-grandmother (J2) have also died. If we do not take action—almost immediately—scientists predict that this population will go extinct. There are three main reasons for the decline in Southern Resident Orcas: lack of food, noise pollution, and chemical pollution. Noise pollution from vessels can prevent Southern Resident Orcas from using echolocation to catch prey. 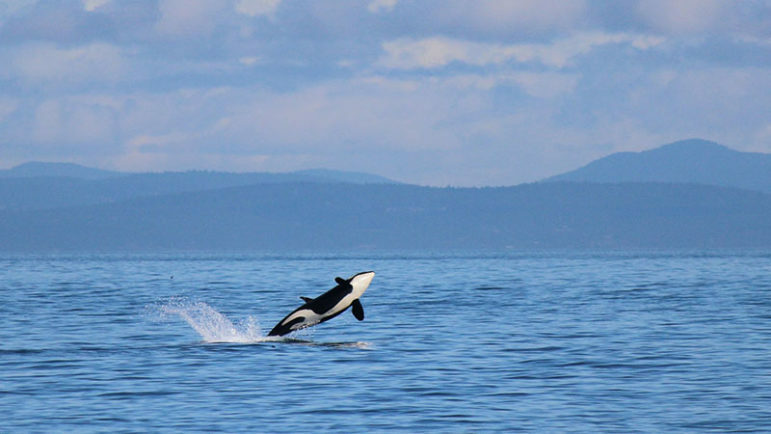 Anthropogenic chemical pollutants like PCBs bioaccumulate in the tissues of orca which cause endocrine and immune system disruption when they starve. These two factors are linked to the primary reason for their decline- which is lack of food. 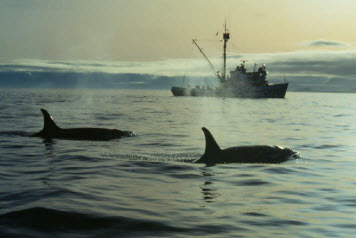 Unfortunately for these whales, they eat almost nothing but Chinook salmon which make up of more than 80% of their diet. Today, two-thirds of orca pregnancies fail due to nutritional stress. Their population decline is primarily due to a decline in Chinook salmon abundance. The mighty rivers of the West—including the Columbia Snake River watershed, a key source of Chinook—have been broken by a series of dams which choke this once free-flowing water system. The four lower Snake River dams kill millions of Chinook juveniles as they attempt to migrate downriver to the ocean. The Fish Passage Center has found that Smolt-to-Adult Returns for wild Snake River spring/summer chinook salmon have declined by four-fold since the four lower dams were built. Scientists are able to conclude that Columbia River chinook salmon have lost two-thirds of their genetic diversity since ancient times, and that will only continue to decline if the current state of affairs persists. The status quo has cost us $16 billion of taxpayer and ratepayer money without recovering a single endangered salmon population. It is clear that breaching the lower four Snake River dams is the biggest action we can take to recover our endangered Southern Resident Orcas population and threatened and endangered Snake River salmon. These four dams have a cost-benefit ratio of 15 cents for every dollar spent and their energy is surplus. Dam removal works for restoring fish populations and marine ecosystems as demonstrated by the large dams of the White Salmon and Sandy Rivers and the enormous Elwha Dam. The 1999 Marine Fisheries Service’s results show that Snake River dam breaching by itself is likely to lead to the recovery of fall chinook and steelhead. The Fish Passage Center finds that dam breaching by itself would increase spring/summer chinook salmon returns by four-fold in comparison to increased spill helping boost returns by 2-4%. National Oceanic Atmospheric Association’s 2016 and 2017 final Recovery Plan for Spring/Summer Chinook admits that despite an extensive list of salmon recovery actions, without dam breaching, lower Snake River salmon runs will not recover. For two decades, conservation and fishing groups have gone to court challenging federal agency plans that have failed to protect threatened and endangered Snake River salmon. During this time, five federal plans have been declared illegal by three federal judges. On March 27th, 2018, U.S. District Court Judge Michael Simon found that current operation of Columbia and Snake River dams is causing continued irreparable harm to imperiled salmon and steelhead and has ordered increased water releases over spillways to improve salmon survival rates for juvenile salmon migrating to the ocean. Agencies are now conducting a NEPA Environmental Impact Statement review that must consider removing the lower four Snake River dams as one of the several alternatives in the analysis. This analysis is due to be completed by 2021. The Endangered Species Coalition is concerned about the extreme decline in the health and biological resilience of the Southern Resident Orcas and the Snake River salmon. The Coalition is working to build grassroots awareness about this plight of the Orca and political support for breaching the lower four Snake River dams as soon as possible. The Endangered Species Coalition works in cooperation with member organizations to support a multitude of solutions that complement each other in recovering our Columbia/Snake River salmon and Southern Resident Orcas, but breaching the lower four Snake River dams is the most effective action that we can take to recover our salmon and orcas. Time is running out. The Southern Resident Orcas could become effectively extinct within the next 15 years if we don’t do something bold soon to help them. The salmon and orca are an integral part of the Pacific Northwest’s culture and economy; we cannot afford to lose them. Removing the lower four Snake River dams will safeguard our salmon, protect jobs, honor the treaties and promises to tribal communities, preserve our Southern Resident Orcas and our wild salmon, boost our recreation and tourism economy, and preserve our Northwest way of life.